As demand for IoT technology increases, many vendors have cobbled together IoT platforms that promises to bring order, control, and economic advantages out of the chaos. The challenge for corporate managers is to sort through hundreds of vendors claiming IoT platform expertise and then decide the best fit for their particular needs. In spite of doubts around IoT platforms such as added costs, complexity, and uncertain outcomes, market demand for these solutions is on the rise as enterprises seek the latest digital tools to optimise their processes and better engage with customers. Often, even large organisations lack the internal skills and tools necessary to integrate an IoT platform, particularly for data analytics and the continual need to stay ahead of potential cybersecurity attacks. Thus, there is a need for vendors that can fill the void with robust platforms in a still emerging market. 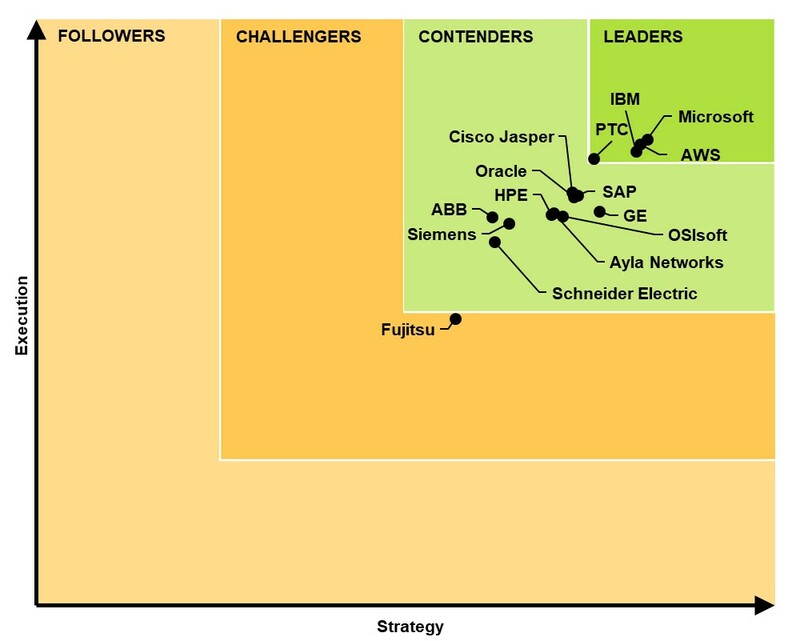 Navigant Research has looked at the Strategy and Execution of 15 vendors offering IoT platforms relevant to utilities and other industries taking on digital transformation projects. These vendors are rated on 10 criteria: vision; go-to-market strategy; partners; technology; geographic reach; sales, marketing, and distribution; solution performance; product portfolio; pricing; and staying power. Using Navigant Research’s proprietary Leaderboard methodology, vendors are profiled, rated, and ranked with the goal of providing industry participants with an objective assessment of these companies’ relative strengths and weaknesses in the IoT platform market. PTC is probably the surprise contender, but it has been pulling together an offering over the last three years with several technology acquisitions. 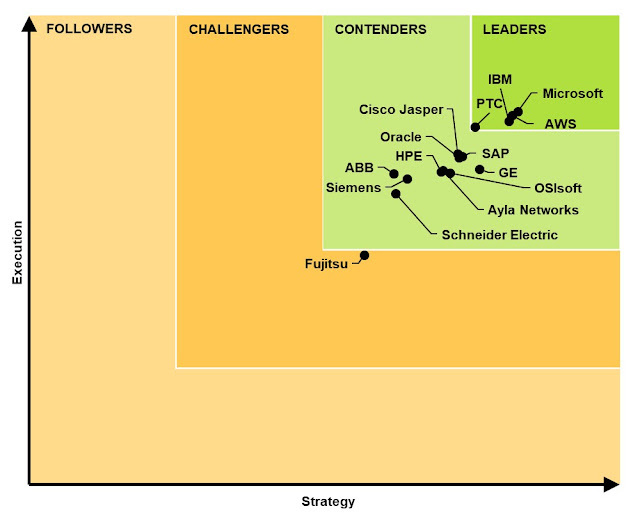 ABB, Schneider and Siemens are all chasing hard, but the interesting thing is that the research doesn't rank the up and coming networks, particularly in LPWAN. These include Objenious, Sigfox and Actility, although independent providers such as Electric Imp and Sigfox have moved their offerings to Microsoft Azure to provide scale.